On the lighter side but offering a nice argument to counter anyone who doesn’t want to buy collision insurance comes a recent column by “#Young Professional” writer Brent McDermott. The bumper has a green streak and prominent dent. The driver’s side door opens up just enough for me to squeeze my small frame into the driver’s seat. And when that door closes, it has the look of a recently shotgunned beer can. But the shabby appearance isn’t what shames me. Every time I get behind the wheel, I’m reminded of my choice to drop my collision and comprehensive coverage and purchase PLPD auto insurance. 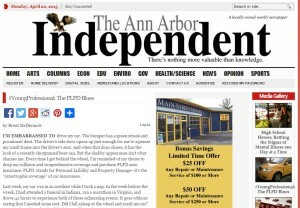 Now the Independent isn’t exactly the Detroit Free Press — it’s not even the main Ann Arbor paper — in terms of local circulation. However, it’s featured on Google News, which means the rueful column will be visible and able to influence others across the country. Or you can just forward it to your friends, kids and kids’ friends who are debating what insurance to buy. It’s humorous and relatable, and it might sway a few young minds into practices that could help them and the collision repair industry. A friend from another state borrowed the car and sideswiped another vehicle in Ann Arbor, Mich., McDermott writes. The columnist has been ducking going to a collision repairer despite his friend’s offer to pay the repair cost out of the fear that his friend can’t cover the bill. “I can’t shake a cartoon image of myself, ten years younger, a fuller head of hair, looking into a crystal ball, seeing a 30-year-old driving a battered Chevy Aveo, and asking, ‘What the f@#$ happened? '” he writes.